Ultimate Vocabulary™ software discusses the emotional world of punctuation marks in a new blog post, eReflect announces. The exclamation mark, the ellipsis, and the period are physiologically dissected for readers’ amusement. ...helps people improve their communication skills by enriching their lexicon with new words. 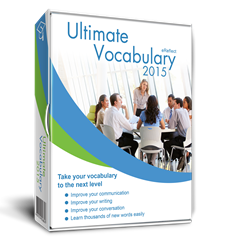 Vocabulary builder Ultimate Vocabulary™ offers an examination of the emotional impact of punctuation marks in the English language, and how these predispose writers and readers to different interpretation of these messages, eReflect announces. The ellipsis is characterized as capricious and rather unpredictable as it is often used and abused in digital communication beyond its intended meaning. While it is used to signify some text has been omitted, in digital contexts it is more often than not used as an innuendo, a statement, or an invitation to engage in more conversation, since the message is ambivalent at best. eReflect is the vocabulary program designer with a goal of helping people increase vocabulary competency and communication skills in general. The company encourages learners of English to take into account the role of punctuation in their writing, as it is a robust, direct way to enrich writing and to offer information without even using words.